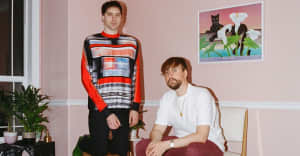 Blanco's clip for "Coke White, Starlight" flits between settings: a druggy hotel room, a lush forest, and one sequences even takes place underwater. "I arrived in Athens with no plan, no agenda," director Tristan Patterson told Dazed. "We'd shoot all day and talk all night and somehow through this intense, insane creative process, we made a film together that I think captures this really personal experience we shared in such a crazy, cinematic way." Watch above, and read more about the video here.